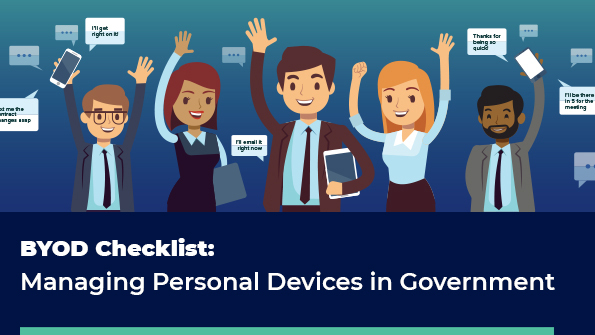 “BYOD”, an acronym that stands for “Bring Your Own Device.” As its name suggests, BYOD organizations encourage employees to use their own devices for work communications — including smartphones, laptops, and tablets — in addition to or instead of government-issued devices. The reasons behind BYOD adoption are simple: Employees want to use their personal devices for work while supervisors want to empower their workforce with tools that make communication and collaboration more efficient and productive. By creating a BYOD plan that targets business-related messages regardless of device or channel, you’re not only ensuring that these communications are captured and archived, but you’re also giving your employees the freedom to work when, where, and how they prefer — and saving significant money in the process. Download this guide to start building your plan.